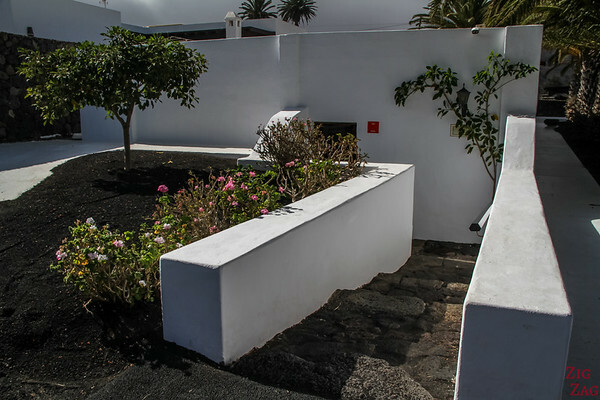 Thanks to the singular vision of César Manrique, Lanzarote has some unique locations where architecture is integrated with nature. 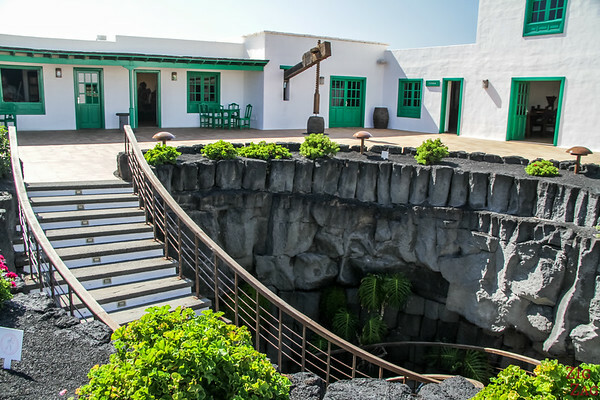 He imagined many amazing Lanzarote Attractions that are some of the best things to do on the island such as: Cactus Garden, Mirador del Rio, Jameos del Agua... Let me guide you through the Art, Culture and Tourism Centers of Lanzarote (CACT). 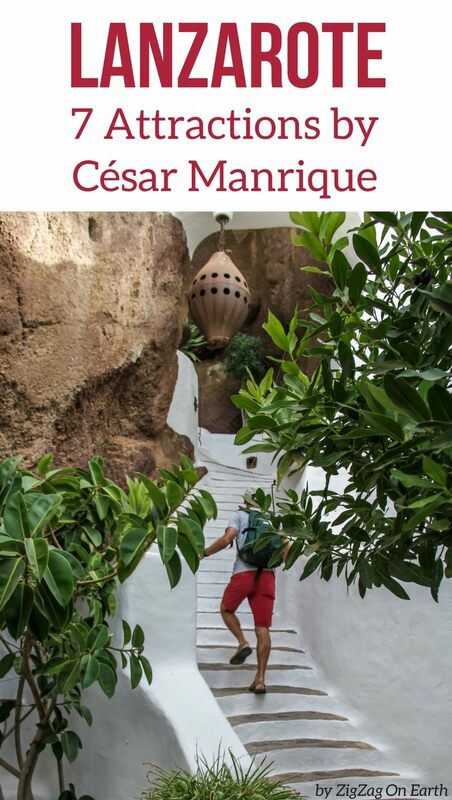 Let's start with a short video that will take you on a visit of 7 places imagined by César Manrique. Admire how he integrated architecture within Nature, using abandoned quarry or natural volcanic feature. 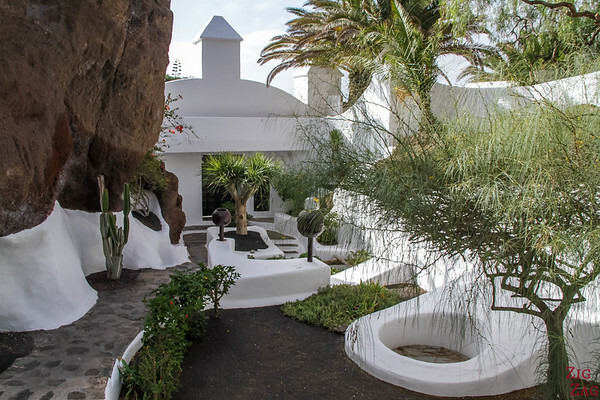 César Manrique has left an indelible mark on Lanzarote thanks to his engagement in respecting the environment and integrating with it. 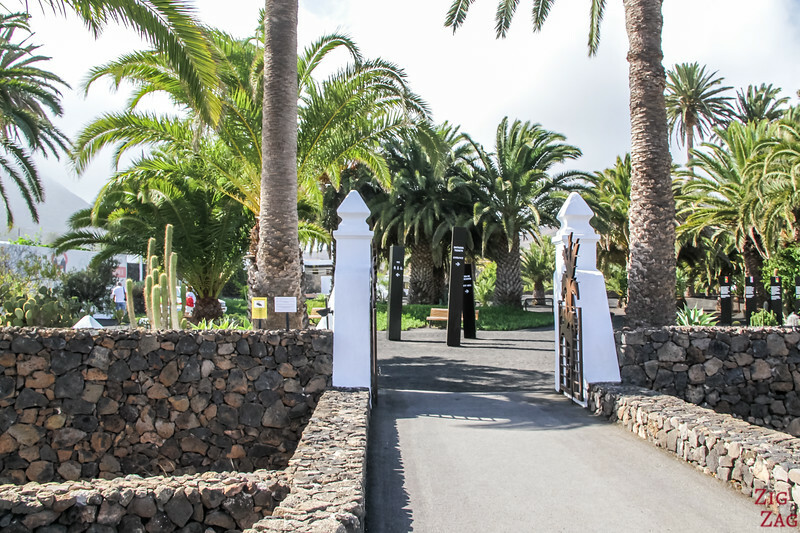 His most prominent Lanzarote attractions are the Cactus Garden, Mirador del Rio, Jameos del Agua and the El Diablo restaurant in Timanfaya. You can read a bit more about his biography here. All of them are easily accessible by car. 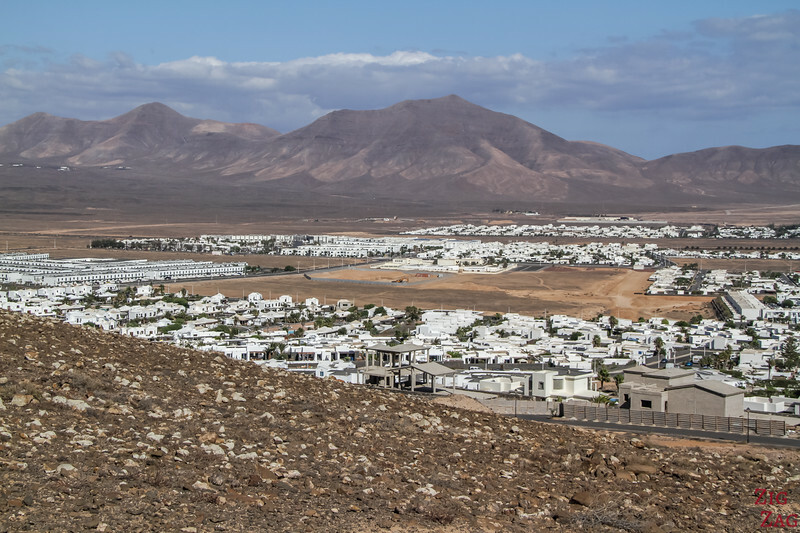 Most of them are located in the North of the island, North of Costa Teguise. So you can group them in one of preferably 2 days. Note that you can purchase a combined ticket for several of the attractions and save money (buy at the first site you visit). 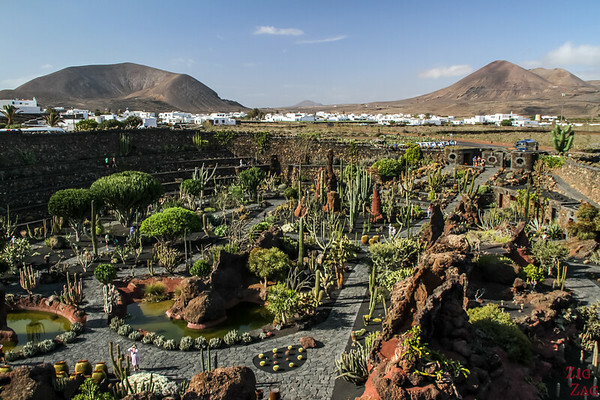 One of my favorite attractions in Lanzarote is the Cactus Garden. 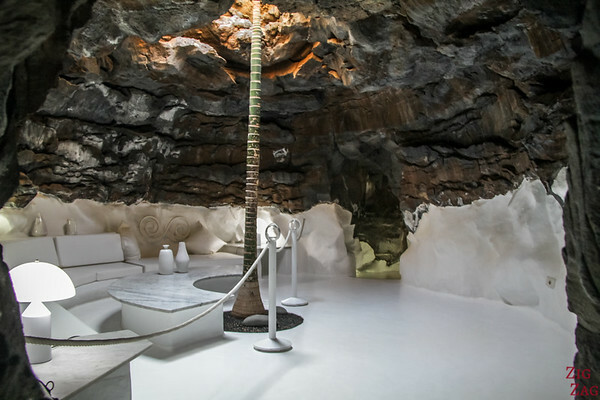 César Manrique imagined how to transformed this abandoned old quarry in a fascinating way. He used the amphitheater to create a botanical garden with 4500 cacti from all over the world (covering 450 species). It integrates perfectly with the shape of the quarry and is dominated by a well-restored windmill. 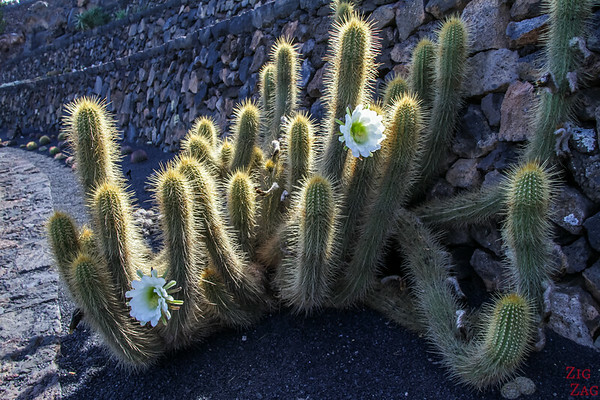 Thanks to the structure, the cacti are protected from the strong winds that sometimes blow over Lanzarote and the plants are striving. 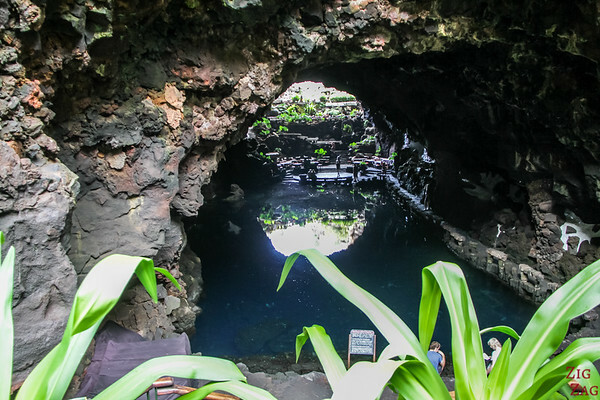 Located on the North of the island, Jameos del Agua is the unique place where what remains of a volcanic tube has been transformed by César Manrique. 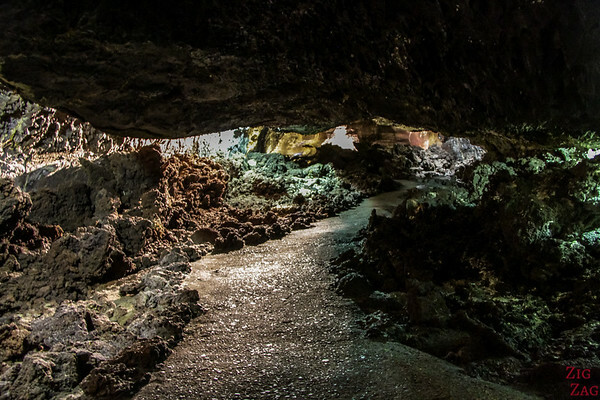 4000 years ago, the volcan La Corona erupted and a 6km long lava tube was formed. Over time, some sections of the tube collapsed creating openings called "Jameos". In the sixties, 3 of those caves and a section of the remaining tube were complemented with gardens, pool, a museum, an auditorium and restaurant. There is also a salt lake with tiny white crabs. 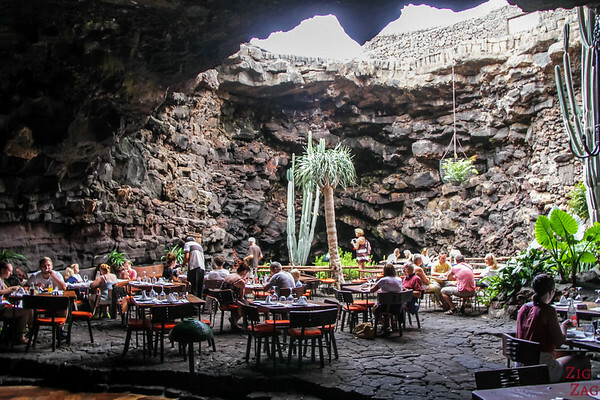 See more photos on my article about Jameos del Agua Lanzarote. 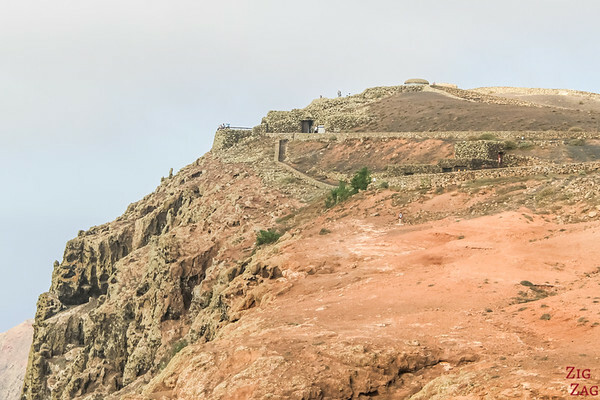 Located on the Risco de Famara, the viewpoint overlooks the island of La Graciosa at an altitude of over 475m. It used to be a military fort from the 19th century. 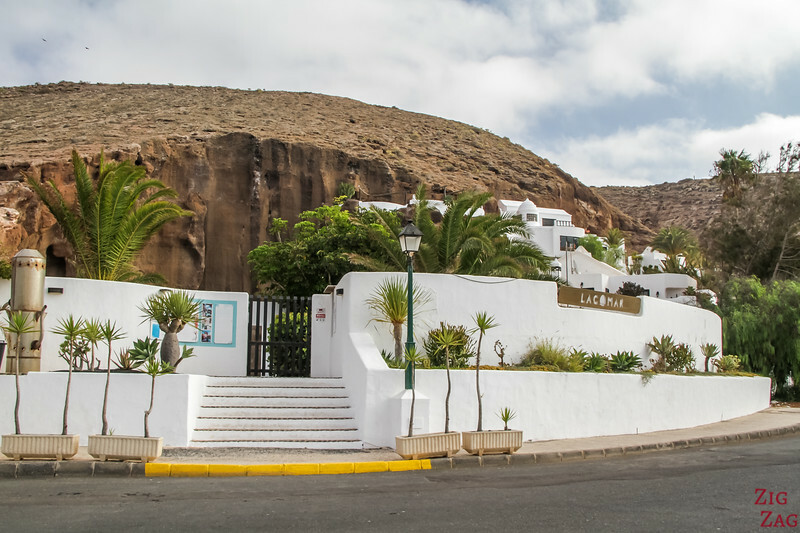 César Manrique transformed it in the 70s to be camouflaged in the rocks and to offer incredible views of the cliff, the island, and the stretch of sea in between called El rio. At the bottom of the cliffs, you can also see the salt pans of Salinas del Rio. The inside building with the white walls and curve offer great framing to the beautiful landscapes. This is one of the top attractions in Lanzarote. 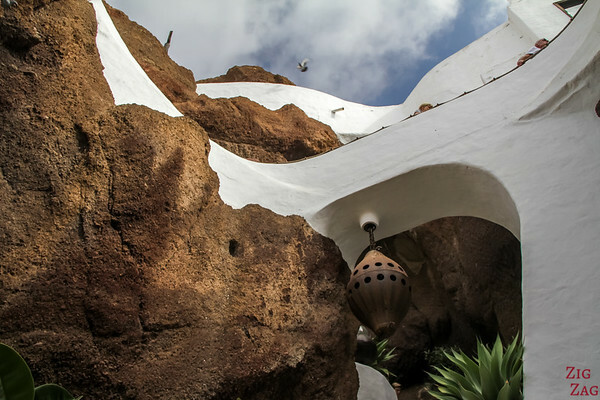 The César Manrique foundation has established its headquarters in a dwelling designed by him and where he lived for 20 years. 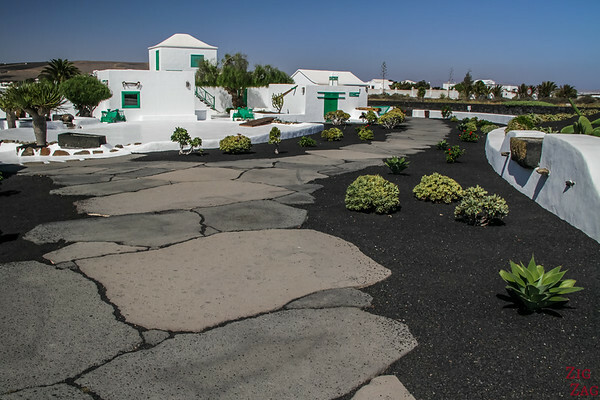 It is built in harmony with a lava coulee formed during the famous Lanzarote eruptions between 1730 and 1736. 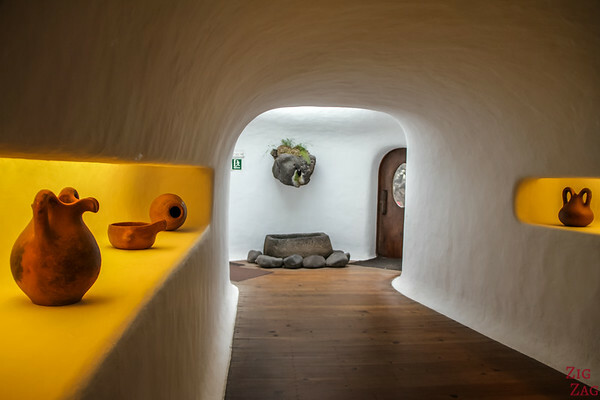 Inspiring rooms have been set up in volcanic bubbles and connected by tunnels. Plan time to also enjoy the garden and its sculptures. 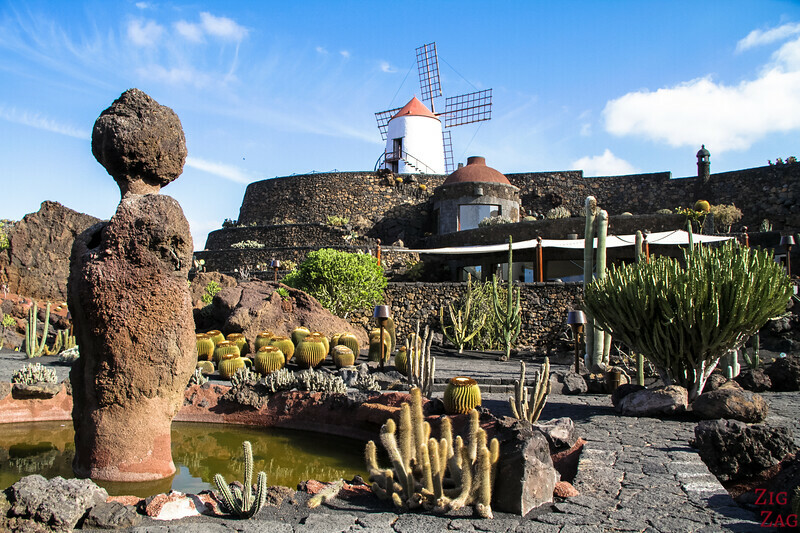 Al Campesino was designed by César Manrique as a tribute to the people working in the fields and their hard work to grow plants in these harsh conditions. The buildings look like traditional homes with white walls and green wood. Inside is a museum where you can find local artisan doing traditional work. But the place is visually iconic because of the 15m tall sculpture, also by César Manrique (1968). 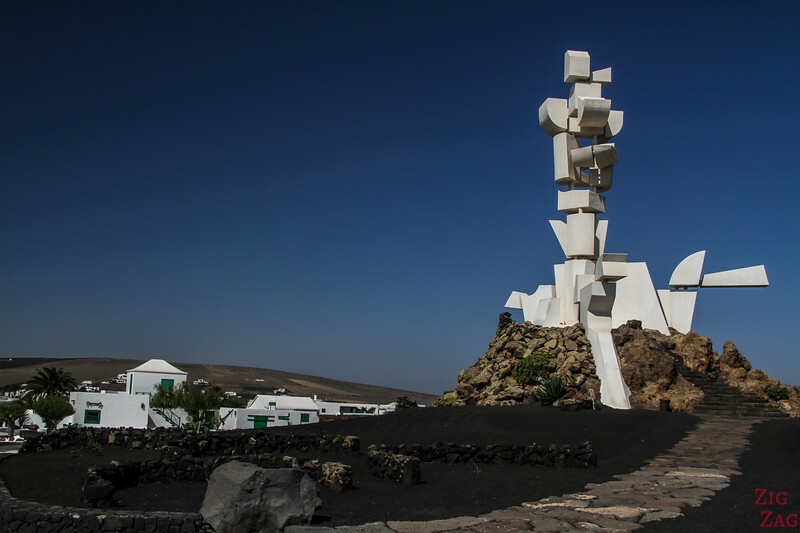 It is called Monumento a la Fecundidad (Fertility monument) and looks like the center of Lanzarote. I love the contrast of colors with whitewalls, green plants and wood, dark rocks and the blue sky. 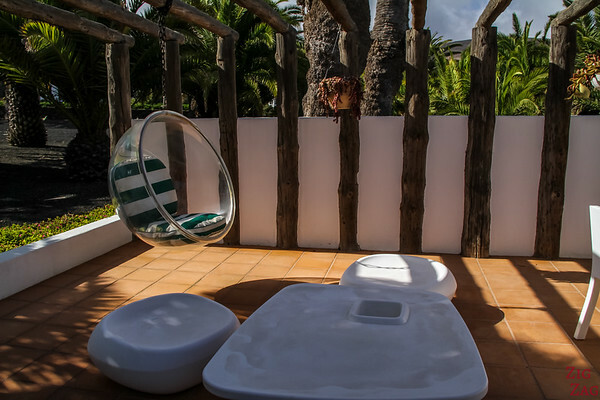 Located in the Northern town of Haria, the house is located in the Palm grove. So if you are missing the presence of trees around you, this is a good place to go. César Manrique used to live in where the foundation is (#4) but in 1986 he began building a new home at a farmhouse. He lived there until his death in 1992. Today it is a museum where furniture and items have been kept as they were. You can also enter his studio and see how he worked. However, because this place is more about his intimacy and less about his work, this was my least favorite of the Lanzarote Attractions related to César Manrique. On many projects, César Manrique has collaborated by another famous artist: Jesus Soto (1923 - 2005). Born in Venezuela, he arrived in Lanzarote in his twenties. He was the quiet artist who brought to reality many concepts and ideas. 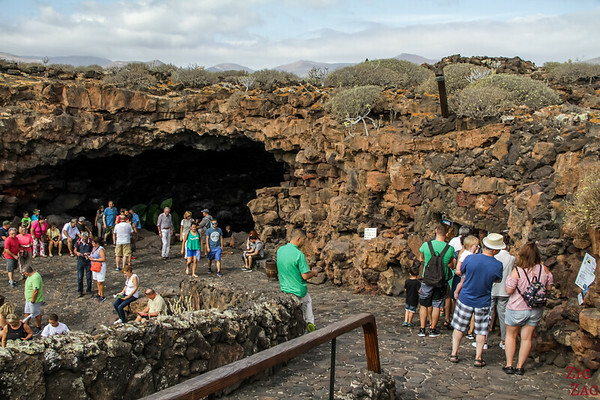 He was in charge of one of the Jameos del Agua entrance, spent time finding the right path for the Timanfaya route and participated in Mirador del Rio, Monumento al Compesino and the Cactus Garden. 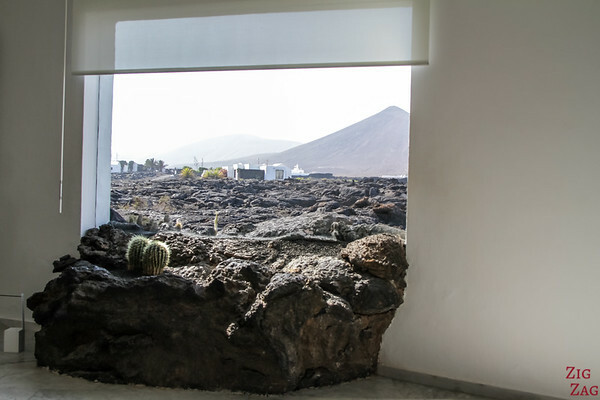 The CACT tourism center even states that he was the one who asked the political leader to convinced César Manrique to return to Lanzarote. 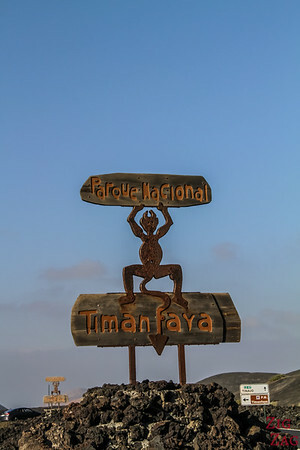 Inside the magnificent Timanfaya National Park, the only structure is the El Diablo restaurant at the starting point of the bus tour. 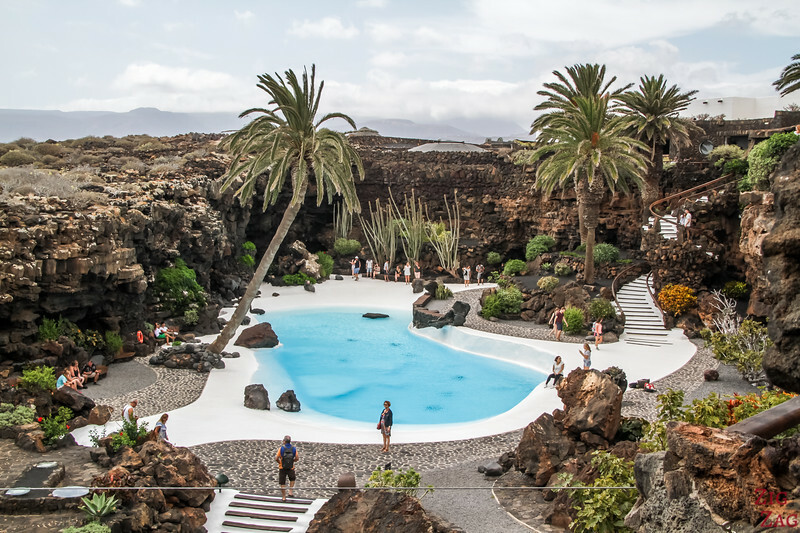 It was designed in 1970 by César Manrique to offer splendid views of this unique, colorful and surreal volcanic landscape. Inside it is also fascinating with a giant grill using the natural heat of the Earth. He also imagined the bus route to see the park which was made a reality by Jesus Soto. 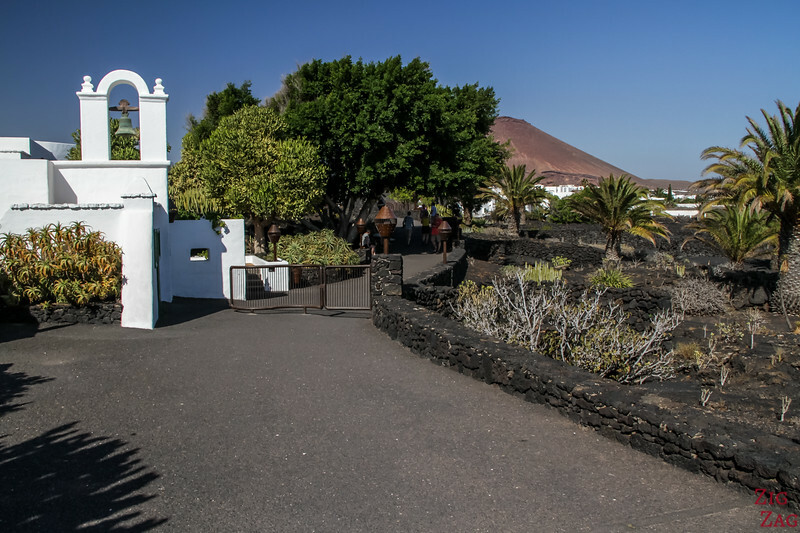 Check out my photos of the most iconic attractions in Lanzarote. 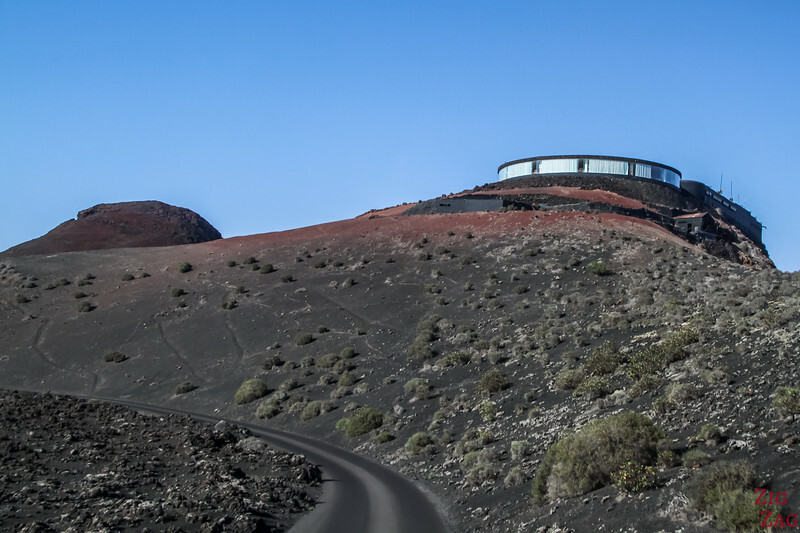 LagOmar is one of the Lanzarote's most spectacular private properties. Imagined by César Manrique and designed by Jesus Soto, it was built in a quarry with natural tunnels and caves. It is quite a labyrinth to explore! In the 70s, Oman Sharif came to Lanzarote whiel filming "the Mysterious island" and bought it. In the 90s it was enhanced by architects from Germany and Uruguay with flora, reclaimed wood beams and many other material. Today it can be visited as a museum. Come early or late to avoid the bus because the space is small. 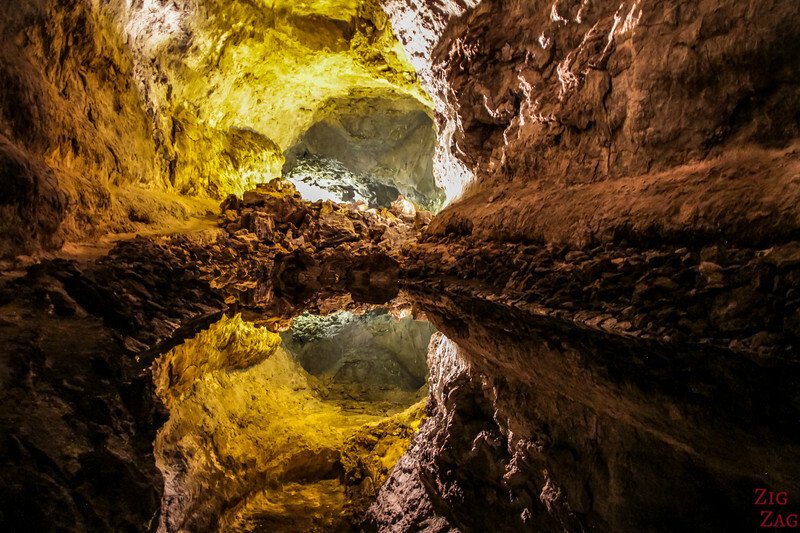 In 1965, Jesus Soto was asked to provide lighting in one of the section of the 6km long lava tube from La Corona. It was to allow speleologists to work. However the artist in him, did nothing simple. He created a new world placing the lights specifically to enhance the cave experience. Today, it you are not claustrophobic, you can enjoy this walk underground with beautiful colors and formation. At the end is a fantastic surprise, but I won't spoil it for you. 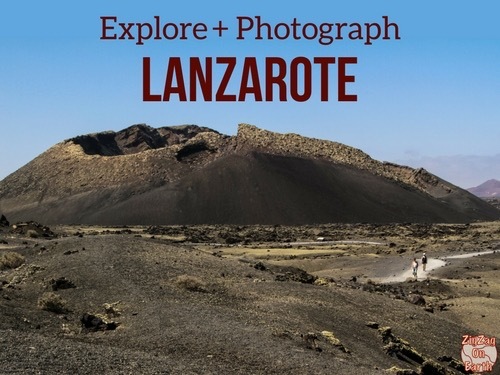 It is one of the main reasons Lanzarote is my favorite of the Canary islands. The architecture has not gone crazy and there is harmony on the land. Except for Arrecife and 1 other building, all the houses are white and limited in height. Thanks to his lobbying for a tourism development in accordance with nature, strong construction rules have been put in place and all the towns have kept a lot of charm.